Dr. Peterson sometimes refers to our traditional hierarchies as hierarchies of competence, since they arise organically out of our necessity to act in the world. To do something is to want to improve the way you do it. Some people will become better than others in some given action. Some people achieve higher ability to cook, some become more proficient in math, others in music, or sports. There are infinite hierarchies in which you may compete. You can even create your own, like Paul Durand-Ruel, Steve Jobs, or Lee Felsenstein, Efrem Lipkin, Ken Colstad, Jude Milhon, and Mark Szpakowski, and enable millions of others to invent new hierarchies. While any hierarchy is subject to corruption, they are inevitable, biologically ancient, and not by necessity pathological or tyrannical. Though those based on power usually are. It’s sort of the point. Social Justice practitioners are telling us all hierarchies are entirely socially constructed, unfair, and oppressive – excepting theirs – which they don’t admit to having. But what else is the jockeying for power in the identity group/victimhood hierarchy about? Given what they insist all the rest of us must believe, I think tyrannical also applies.` And we don’t even have the comprehensive doublethink manual yet, since they’re fighting over it. To advance their cause with less embarrassment they need is a kinder, simpler way than Twitter fights to sort it out, preferably based on objective analysis of the victim/oppressor ratio. Because nobody is a perfect victim. If they did find the perfect victim, they’d have to make him/her/it/zir/xe/Mr. Mxyzptlk the Dear Leader of the world utopia. You might think of it as the ultimate inverse hierarchy, because actual competence in any real thing is a Western, white, colonialist, patriarchal concept. To be avoided. I surely don’t understand the intersectional nuances that would allow me to compare a black gay male who hires a fake hate crime attack on himself, with a brown cis-gender (and why do I have to use a made up term now to indicate ‘normal’?) female who spouts anti-semitic drivel in the US House of Representatives. An objective assessment may well be impossible. Each individual objecting to someone else’s existence will have their own criteria. We could ask them all their opinion of everybody else and average the results (sort of like Facebook); Throwing out those rated below some arbitrary score – by other voters whose ratio was in the top 1% on the victim/oppressor ratio scale (sort of like Twitter). Running, especially enforcing, that system would be the prize for winning the victim/oppressor ratio sweepstakes. Still, if we were to attempt objectivity, even to arrive at an informed individual opinion, a complex spreadsheet to calculate power rankings might serve. We’re after a way to model other people’s thoughts. We need to place the technology into individual hands, since it is obvious we can’t depend on the SPLC anymore. Let’s consider the complexities via example. 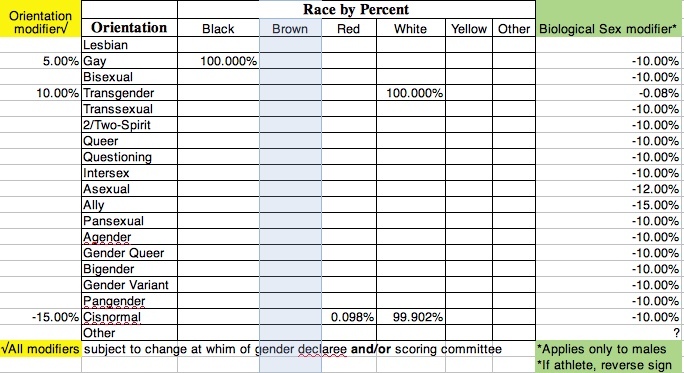 Rate a black, homosexual male, wealthy actor; vs. a white, trans-female, wealthy former Pentathlon champion; vs. a brown, female, anti-semitic, Islamist congressional member; vs. a white, 1/1024th Amerind, biological female, wealthy United States Senator. It’s not easy, and those are only a few of the factors. The enterprise seems very difficult. This is the type of analysis intersectionalists demand as a principle of governance. And, that’s just a poor preliminary attempt to begin to capture the variables currently driving the SJW power struggle. It doesn’t include anywhere near the required profile information. I tried filling it in for a couple of people I thought would help refine scoring. Maybe you can guess who they are. Complicating this further, just when you might think you have a workable algorithm someone gets offended by something you did not expect. For example, here’s an example of a lesbian, Leftist, female academic in the Humanities you’d expect to score moderately well: A concrete example against which to test our calculation of the victim/oppressor ratio. Aha! The problem is Paglia’s opinions and outspokenness, which one could at least imagine being held by a “queer person of color.” It isn’t about color. The entire identity politics internecine war is about thinking the right thing. Thinking correctly is hard to define, though. It depends on the thought processes of the person thinking about someone else’s thoughts. See: Red Guards. Full circle we have come. When objectivity is thrown out the postmodernist window, objective rankings are simply impossible. And that’s intentional, since any reference to a set of rules could inhibit the exercise of power. Clarity of thought, rational arguments, philosophical consistency are irrelevant. We don’t need no freaking spreadsheet to identify thoughtcrime. Besides, Excel itself is oppressive because it uses numbers, and its very name is a violent affront to nihilistic mediocrities cowering in their safe spaces everywhere. It’s not so bad though, those of us not caught up in the victim-identity Olympic trials can eat lots of popcorn while we watch. In one case a noxious man’s hoax is forgiven, in the other a noxious hoax is employed to destroy many men. In both cases, it’s Progressives in charge. “I think she has a different experience in the use of words, and doesn’t understand that some of them are fraught with meaning that [she] didn’t realize, but nonetheless that we had to address,” Pelosi said. Pelosi made a similar statement on Thursday, when she told reporters at a press conference that she believes Omar didn’t understand “the full weight” of how other people understood her words. “When you cross that threshold into Congress, your words weigh much more than when you’re shouting at somebody outside, and I feel confident that her words were not based on any anti-Semitic attitude, but that she didn’t have a full appreciation of how they landed on other people, where these words have a history and cultural impact that may have been unknown to her,” Pelosi said. Nancy’s excuse for Omar is certainly absurd. It’s also condescending, imperialist, and culturally supremacist. Poor little Muslim girl doesn’t have the background to understand her own words. She’s only been in the United States for 24 years. I guess that’s the white woman’s burden, Pelosi style. I can’t understand why all the woke Twitter users haven’t declared a fatwa on the Speaker. 2019 marks the thirtieth anniversary of Francis Fukuyama’s seminal essay for the National Interest “The End of History?” Its central hypothesis was that we were witnessing “the end point of mankind’s ideological evolution and the universalization of Western liberal democracy as the final form of human government.” That looked plausible in 1989, particularly when the Berlin Wall fell just months after the essay’s release. Thirty years later—not so much. To be fair to Fukuyama, he never suggested that the world had seen the end of geopolitical conflict or that democracies would experience no more of Macmillan’s “events.” Today, he continues to view liberal democracy as the best form of government, but he is less optimistic about its robustness. It’s hard to disagree with him. The Brexit chaos, the Trump presidency, the collapse of support for centrist parties across Europe, and the pervasive rise of populism and nationalism, all point to the growing fragility of liberal democracy. Why is this happening now? The usual response is to blame it all on the politicians. Leaders like Orban and Trump are subverting the institutions at the heart of liberal democracy. Political parties like Alternative für Deutschland and the National Rally are promoting illiberal and xenophobic policies. If only we had better leaders, democracy would flourish—so goes the argument. That last sentence is exactly the same excuse Socialists and Communists use for state failures in the Soviet Union, Cuba, Venezuela, Cambodia, North Korea, et. al.. A majority of voters in this country agree with it, even as they are split on policy. That last sentence describes the danger of the Imperial Presidency – something that connects Obama and Trump (they’re hardly alone, but it became an art form under their tender care). That last sentence describes voters’ aspirations. It explains Bernie Sanders, Ocasio-Cortez, and Donald Trump. Not that they all share policy ideas, but that a sufficient number of voters see them as saviors. This is a terrible way to think about public employees. The Obamaists and the Trumpists both revere the Man, not the Law. Their Emperor’s ideas are fully clothed in their own narcissism. Read the whole article, it presents some good ideas about cultural changes contributing to the problem and the related role of social media. Yesterday, I mentioned Representative Ocasio-Cortez’ happy dance on the bridge she burned to prevent economic aid supplied by Amazon from reaching New York. Consider parallels to recent activity on the Simon Bolivar International Bridge between Colombia and Venezuela, where Senor Maduro is burning humanitarian aid trucks to prevent starving Venezuelans from eating. The differences? Aside from burning figurative bridges instead of actual trucks, Rep. Ocasio-Cortez is not in a position to enforce her Green New Deal on the nation. If she were, the difference would be time. In which we can observe the effects of the “Democratic Socialism” Congressgirl Ocasio-Cortez propounds. She’s tickled pinko that Amazon decided not to locate their 2nd headquarters in New York. Make no mistake, at the end of the day we lost $27 billion, 25,000-40,000 jobs and a blow to our reputation of being ‘open for business.’ The union that opposed the project gained nothing and cost other union members 11,000 good, high-paying jobs. The local politicians that catered to the hyper-political opposition hurt their own government colleagues and the economic interest of every constituent in their district. The true local residents who actually supported the project and its benefits for their community are badly hurt. Nothing was gained and much was lost. This should never happen again. Meanwhile, New York faces a shortfall of $2.3B in tax revenue and blames Washington. New York property tax rates are Donald Trump’s fault, of course; though I, for one, am tired of subsidizing rich New Yorker’s (those whose property attracts taxes of over $10,000) Federal income tax. Property taxes are a tax on wealth, which the Left is proposing to expand. So, shouldn’t these Progressive, civically minded, wealthy New Yorkers be glad they’re no longer allowed this huge loophole? I guess not, because they are leaving New York when the true cost of New York government is revealed. Tell you what, raise the standard deduction again (it was just doubled) by a symbolic one dollar and eliminate the property tax deduction entirely. I own property, and I’m good with that. The classic model of a capitalist business actually forces critical, creative thinking, or the business dies. The academic model has baked in incentives and protections for the groupthink we observe. “The University,” could only survive as a respectable institutional concept so long as diversity of thought was critically valued. It isn’t anymore. In fact, the opposite is true. Groupthink came before the abandonment of “critical thinking, skepticism, caution, or solicitation of opposing views,” and was necessary for that abandonment. Now, you may accurately point to Google’s treatment of James Damore as a business exemplifying advanced hardening of the categories, but this is also only possible where diversity of thought is suppressed – and where amoral business practices are hidden from customers. That may be business, but it will not be good business in the long run. IAC, I’ll posit that even Google fosters a higher level of freedom of conscience than your average sociology department. As to “ignoring entire fields of research,” and “task force[s] appear[ing] … stacked with people who had taken prior … views,” we can see this rot in the social sciences penetrating the hard sciences. The IPCC folks serve as a clear example. A friend recently shared that sentence (not his) in an email. It’s in regard to an article at The Daily Signal by Sebastian Gorka. The idea of abandoning rational argument just keeps nagging at me. It’s a capitulation to the Know Nothings on the Right and on the Left. The writer [Gorka] makes a vital point that most people who support capitalism miss: we will never win the argument about capitalism being superior to socialism because many voters are only interested in emotions, not arguments. Accordingly they feel that capitalists are mean and socialists are compassionate, concerned about people. The only way to be compassionate is to take from the capitalists and give to them since capitalists got rich by making them poor. Unless and until conservatives can make a compassion appeal they will lose politically more and more. Forget trying to reason with people for whom reason is never a part of their feelings. So far Democrats have won the compassion battle. Republicans have always been out-compassioned. A completely different approach is needed. I think it can be done. Republicans can start by stopping trying to win rational arguments. They don’t win with apolitical voters who vote based on feelings. This is one possible reading of the article, and it is in accordance with warnings from Alexis de Tocqueville and Ben Franklin about populism. I suspect they’d see the proposed solution as just the same problem, merely from a different political starting point. The Gorka article speaks extensively to the poor results from voting based on feelings as opposed to ideas. It is not about abandoning rational argument, however. It is about branding. Gorka is urging us to recast the conservative brand because voters are disinterested in ideas. He then makes the mistake of conflating Trump, “Donald Trump has opened a window for the conservative movement of the 21st century,” with conservative ideas; which is a good part of the problem. So. We should take the Ocasio-Cortez Green New Deal as she suggests… “aspirational”; and respond with our own surreal proposals because we can’t win otherwise? What would that argument look like? Genetically re-engineering cows into carbon dioxide breathing unicorns; modifying humans to have fairy wings in order to eliminate airplanes? If the emotional high ground has already been seized, as Gorka suggests, how would you get it back? Mockery suggests itself. Mockery of AOC’s ideas. You can’t mock the emotions invoked by an appeal to universal human well being. Showing the consequences of Utopia requires rational argument. OK, unicorns and fairy wings are probably unfair to Mr. Gorka. But without concrete examples, what emotional threads do we pull to change these disinterested slugs into critical thinkers and not just a right-wingish, populist personality cult? If liberty doesn’t stir their emotions, what will? Whatever it is, if we’re to be successful, we need to connect it to liberty. In contemplating the purpose of recasting a brand, a recent example might serve well. Gillette’s “Toxic Masculinity” ad was about emotion not razors. : “Men! Feel good about yourself when you act like radical feminists.” Virtue signaling. Virtue signaling is not how we save “conservatism” in the age of President “Brand is Everything.” Frankly, until the virtues we need to signal are once again widely considered virtues, chances of success are small. Classical liberals have our own rational aspirational narrative, of which the Bill of Rights is a good example, and we should stick to it. Otherwise, when reality impinges on the Green New Deal we’ll be intellectually defenseless as well as destitute. Like in Venezuela, it’ll be the emotionally motivated women and children who suffer most. I aspire to avoid that. There is compelling evidence that people vote based on emotion, so a charitable reading of Gorka’s piece would be, “The emotional commitment to classical liberal values has gone missing. We must reconnect it.” If so, we need to start with the educational system, not branding. There’s quite enough re-branding of classical liberal ideas coming from the White House already. The more I contemplate that, the more I think it captures the essence of my objections to Donald Trump, a man who can declare a national emergency and immediately comment, “I didn’t need to do this.” The emergency is aspirational, apparently. But it promotes his brand. And the Pentagon will pay for it. This all reminded me of a TOC post: Intentionality, which I think speaks well to the importance of ideas and the bankruptcy of our educational system. It is well worth reading in conjunction with this post.